The new deal has been in the making since Turkish President Recep Tayyip Erdogan’s visit to Venezuela in December. 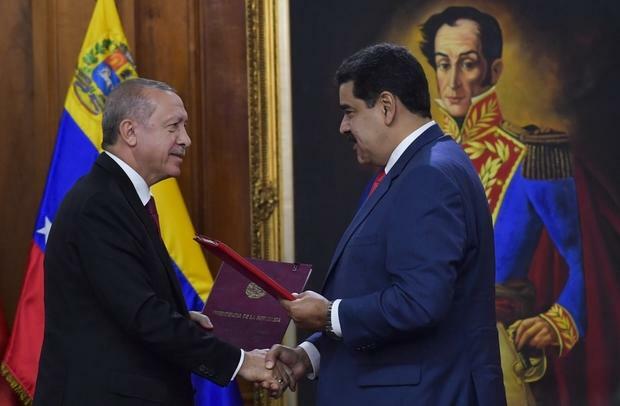 Erdogan had personally introduced businessman Ahmet Ahlatci to president Nicolas Maduro as a likely candidate to refine the gold. "They have significant problems in producing and refining the oil," he said of Venezuela. "Most of the oil income also has been automatically deducted by the international parties for Venezuelan debt overseas. Naturally gold came forward as a good choice," Ozkan said. Ankara may also play a role as mediator for regional politics in South America, the source added. For example, the source said, Colombia and Venezuela, who endure tense relations that hit rock bottom last year with threats of military clashes, have secretly tried to explore turning to Ankara as an arbiter to conduct reconciliation talks. Ozkan says Turkey’s relations with Venezuela will probably deepen the problems between Ankara and Washington, adding to the strain of ties between the NATO allies because of disagreements over US sanctions on Iran.